On the way to Sai’y, the adhan for Dhuhr went off. I was on a walkway that passes over Safa and Marwa, on my way to outside, to find a staircase to the roof. The walkway was maybe wide enough for 6 people to stand side by side. When the adhan goes off, people stop wherever they are, throughout the city, and form lines and pray right where they stand. I got stuck on the walkway, tried going forward to get outside, but everyone in front had already formed their lines, there was no way I could turn back either. So, I stopped where I was too, and just formed a line with those next to me. Others behind me kept pushing through, even after the prayer had begun. It was so packed, I started weeping in salah. I just had this thought like, “Look, this is what we do, we crunch ourselves into tiny spaces to worship you, Ya Allah. People push past us on their way out, carelessly shoving us while we pray, but we must bear it and continue. This is our nature, this is who we are – small, insignificant. You are truly Magnificent and Glorified. You tell us to come here, to complete these rituals, exactly the way You say and we do our best to follow. Please forgive me, please protect me, please benefit me by what I’ve done for your sake, for I have no power to benefit myself. I have no station by which I may protect my own soul. It is truly all in Your Hands. My existence is completely at your whim, just as I am now, physically, in sujjud (prostration), an inch away from those around me. My face is pressed into the same ground thousands of people, myself included, had just been walking along. Allahu Akbar.” In retrospect, I don’t think I’ve ever felt closer to Allah in prayer as I did then. I went upstairs and ended up on the roof. The rush everywhere else was unbearable at this point, I was much more willing to brave the hot, midday desert sun and heat, on the uncovered roof, than pushes and shoves. First though, I needed to rest, desperately. I found some shade and sat down, then laid flat on my back. Reminded me of that yoga position, “open and ready to receive”. It felt amazing, like I was melting into the cool marble floor. After a while, I got up and wanted to write for a little bit, so I pulled out my journal…and was horrified. It was soaked. I was like, OMG NO! I went through the pages to see the damage. The edge of every page I had written on so far was soaked..with sweat..? I think I sweat through my bag and soaked the book? Or maybe it’s from being pressed against other people and getting their sweat on it? I’m not entirely sure. What’s amazing is that the pages I hadn’t gotten to yet were dry, subhanAllah. Only pages with writing were wet. That’s purely a test. The words weren’t bleeding, the ink wasn’t running, which was very, very good. The pages were stuck together though. I didn’t want them to dry that way or they’d rip when peeled apart after drying and maybe mess up the letters and become illegible. I remembered suddenly that I had packed a small hand towel in my tote bag that I still hadn’t used, from the airplane. I actually yoinked it from the first class bathroom, after I snuck in when the lines were too long for the bathrooms in our economy section. Finally came in handy though ;). I put the towel on each page and pressed down with my pocket Qur’an to soak up the moisture. Took me a little over an hour to do each page, 90 in all. It was time-consuming, but it was working, the pages were dry enough that they didn’t stick. Alhamdilillah, I think it worked out, it’s still not entirely dry, at 4:30am, but it’s almost there, and the unused pages are totally unaffected, so I can continue to write without issue. I would have been so devastated had I lost it, the collection of my thoughts and heart’s reflections and ponderings. Had to get tested though, I understand. I recognize that I have to get tested with everything I have that matters to me, to see if I turn to Allah with that threat of losing each thing. The only other thing I needed to get tested on, the only thing left, was my parents. Suddenly, when this thought crossed my mind during my Sai’y, I realized that I had totally left myself open to be tested there too! We had set such a shifty rendezvous place to meet at after we were all done with our rituals, what if I can’t find them! I went to the edge of the roof and looked over to our meeting spot, the bathroom in the courtyard outside of the masjid. There were like 100,000 people standing around our meeting spot. I had already taken an hour and a half break, what if they get there way before me and can’t find me and freak out and do something hasty? Sure enough, the test came like clockwork :). I finished my Sai’y on the open roof, which wasn’t so bad, I did it in an hour. There were very few people up there, so there was no rush. It was also made more comfortable with the easy access to the cold ZamZam fountains all along the sides, which are normally jam-packed during Sai’y. I moistened the hand towel I had with cold ZamZam and covered my bald head with it to stay cool and to keep the sun out of my eyes. So glad I chose to do this instead of doing this indoors with everyone pushing and shoving and packed tightly together. When I got down to our meeting spot, I walked through and around the entire area in search of my parents. Nothing. No cell phone either, and we had to take a taxi back still, we HAD to go together. Even though I suspected this would happen, I still had to deal with it somehow. I made du’a, and went around a second time. When I was inside, in the shade, I heard my mom call out to me. I saw her and was like, SubhanAllah, this is all Divine Support. Give in, remember Allah when you’re tested and He supports you. It’s real. My favorite thing about Hajj has been learning to trust Allah and how to seek His Help and Support. 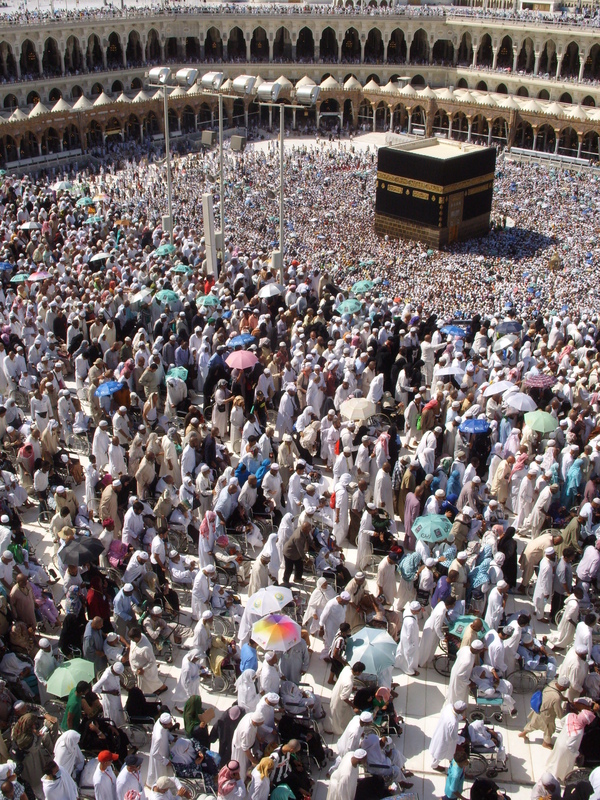 Hajj is like a crash course in dealing with hardships and tribulations. You need this now, not when you’re old, with one foot in the grave. Go as soon as you can, trust me. My parents had just gotten there 2 minutes ago, so we basically got there around the same time. We tried to get food but couldn’t make up our minds about where to eat. Not having decent options made it difficult again. We ended up just grabbing ice cream and hopped on a bus to go to the Jamarat. It was 3pm. SubhanAllah, I was so amazed at our timing. I even took a break before doing Sai’y and we still ended up together at basically the same time. The bus was packed, we had to stand the whole way. We were all so tired, my feet were blistering. We finished our ice cream on the bus and I was looking for some place to set down the empty cups. I placed them in an empty overhead compartment and they somehow fell over and spilled. My ice cream soup fell on the old Indian man sitting beneath the compartment, his seat and shirt got stained. I felt so bad! :/ He didn’t really say anything though, he actually even moved over and offered to let me share his seat with him. How sweet mA. I couldn’t do it though, the orange stains across the shoulder blades of his otherwise pure white shirt made me feel too bad. Another test. That was the first time I’d really done anything ‘harmful’ to someone here, and thankfully it was by mistake at least. I apologized to him and he made no fuss whatsoever. The trip took an hour, the driver got stuck in so much traffic that he couldn’t take the bus any further. He told everyone that he refused to go on and made us all get off, a mile away from our destination. We got out and walked the distance to the Jamarat and did our Rami’ (stoning) and made our way back to the camp. We had to stop like 4 times on the walk back, we were all in so much pain. We even laid out our prayer rug and just sat down and chilled until Maghrib, outside of the Jamarat. For miles, everywhere you sit, the police come by and yell at you to get up and keep moving. You can’t even rest peacefully when you’re so exhausted and worn. Thankfully, since prayer time was close, they let us stay in our place until after prayer. Off in the distance, you can see the clock tower of the Haram, protruding into the sky. At times for prayer, the tip of the tower sparkles and glitters to show that the adhan is being made. We watched from miles away, until the lights stopped flickering, and then performed our Maghrib prayer. Immediately afterwards, the police officers returned and shooed us all away again, so we set back onto our journey back to Mina. salaam, ive just spent the last hour completely engrossed in reading your diary (great stuff!). I also just completed hajj this year with my parents at the age of 20 Alhamdulillah (may Allah accept!). I really enjoyed reading this, its not even been a month back home yet i yearn to go back. May Allah reward you for your effort in uploading this as i really was able to connect with your experiences.